Are you looking to convert your regular 24” - 26" single speed Mens bike, cruiser or a multi speed mountain bike into a motorized bike or moped? Then this EPA Approved/Certified bicycle motor engine kit comes with everything that you'll need! You will be able to stop or start the engine as you ride. There is rope pulling needed to start your engine and it goes up to 40 MPH and gets around 150 miles on a gallon of gas. Please Tell a Friend about this product and help spread the word about Motorized Bicycles. Wholesale Storm 49cc Bicycle Motors can be made here. 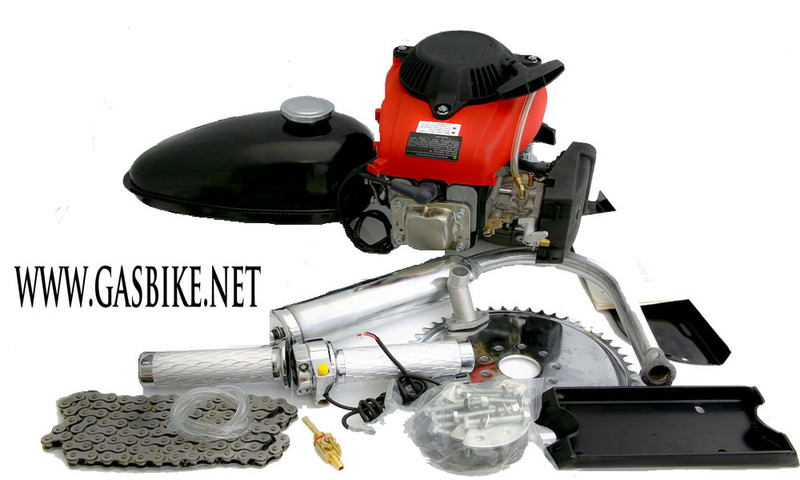 This 49cc bicycle motor engine kit is about 8.5" height 7" length 5" width and fits on most standard 24” – 26” or 25mm 29mm frame bicycle frame tubes. Larger frame size requires drilling into bike frame and use the universal face plate. This engine kit only adds about 20 lbs to your bike.